12k is pleased to announce the release of a new, limited edition CD from acclaimed Canadian visual and sound artists Skoltz_Kolgen. Postpiano 07.05 presents eleven variations of Kenneth Kirschner’s “November 11, 2003,” the source material for Post_Piano 2 (12k1032) by Kirschner and 12k’s Taylor Deupree. 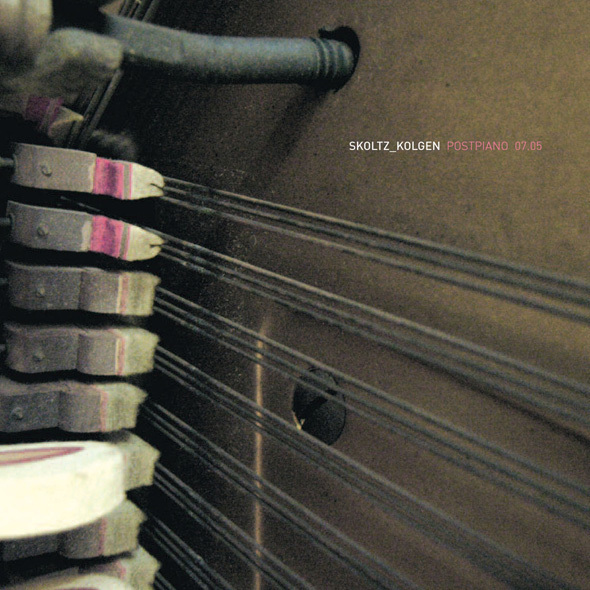 Skoltz_Kolgen’s new CD extends the open source process of interpretation that began with post_piano 2 and continued with the Post_Piano 2 Open Remix Project (term.12). "Our explorations for Postpiano 07.05 were created upon returning from London. It was July, and the terrorist bombings had taken place during the very same days that we were presenting a performance. During the week following our return, as a release or an effect of saturation, we created over twenty variations departing from the piece 11.11.03 by Kenneth Kirschner. Faced with an inability to decide which piece to present to 12k’s term., we sent Kenneth and Taylor our explorations to allow them to choose for us. It was an honor and a pleasure to learn that Taylor desired to release the collected variations on CD. " all audio on this cd was created from the Kenneth Kirschner’s "11.11.03"